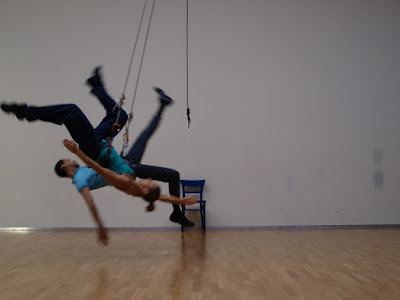 Luftdanza ( www.abelnavarro.com ) organize one day meeting with Aerial Dance/Harness and Ropes . Our work is a combination of Aerial dance, Contemporary Dance and Acrobatics. Duets and solo works, using harness and ropes as a medien to dance and create a new perspective defying gravity . organics dance movements in sequence to organize and prepare our body for the ropes, centralize and organize your center as main point for our work . The class is organized in three diferents phases. 1 : first contact with the material, giving and share our body weight and gravity test . 2 : Learning Aerial dance Technic trought short Choreographies . 3 : Partner work , using the floor and Partner , impulses and manipulation. Time : from 09:30 to 12:00hs and 12:30 to 16:00 hs. facebook: Luftdanza Abel Navarro .